Finding the Jivas in acute distress and delusion, and that they have deviated considerably from true Parmarth and are totally incapable of releasing themselves from the bondages of birth and death, the Supreme Being Radhasoami Dayal was moved with immense compassion. He incarnated Himself in this world in 1818 as Sant Sat Guru, in the form of Param Purush Puran Dhani Soamiji Maharaj and revealed an easy and simple path for the salvation of Jivas. RADHA is the name of the Dhun (reverberation) and SOAMI is the Shabd (sound). Know that Dhun and Shabd are one and the same, like water and its wave. Make no distinction between the two. RADHA is the lover and SOAMI, the beloved. RADHASOAMI sings of the union of Surat and Shabd. RADHA is the Name of the Adi (primal) Surat and SOAMI is the Adi Shabd. RADHA and SOAMI form an inseparable pair like Surat and Shabd. Know that both Radha and Soami are one word RADHASOAMI. As Surat dallies with Shabd, so does RADHA abide in close union with SOAMI. "Radhasoami" is the true and real name of the Supreme Creator. The goal of the Radhasoami Faith is the only true goal; of true and perfect salvation which can be attained only by practising Surat Shabd Yoga (union of spirit with sound current). As per Radhasoami Faith, the entire creation is divided into three divisions. Spiritual: The First or the Highest Division is called Sat Desh or Dayal Desh (region) where pure spirit, uncontaminated by mind and matter, exists. It is comprised of six sub-divisions. Spiritual-material: The Second Division is called the Brahm Desh or Brahmand where highest and pure form of mind and subtle matter exist with spirit; the latter predominates. It is also comprised of six sub-divisions. Material-spiritual: The Third Division is called Jiva Desh or Ichchha Desh or Pind Desh or simply Pind where matter is coarse and impure, and spirit is feeble and to a certain extent under the control of the forces of mind and matter. It is also comprised of six sub-divisions. Sant Sat Guru: The personification of the Supreme Being. Sant Sat Guru or Sat Guru is He who has either descended directly from the Highest Division or reached that region by the practice of Surat Shabd Yoga under the immediate direction of the former and has become one with Him. Sat Shabd: The sound proceeding from the original source, i.e., Sat Desh. It undergoes some change, or in other words, is enveloped in coverings at every step in its descent. Satsang: As without Sant Sat Guru there can be no Satsang, the word "Satsang" always connotes, to a votary, association of Sant Sat Guru who is the central pivot on which the entire Faith hinges. Satsang can also be held in the company of loving devotees. This is outward or external Satsang. Internal Satsang is the company of spiritual current within. It consists in listening to the spiritual sounds internally. Sat Anurag: Also known as true love or Prem. Radhasoami Faith consists only in cultivating an affection, or rather an intense love, for the Sant Sat Guru. The relation between the Sant Sat Guru and the Satsangi or devotee is purely of spirit or holy love, love to begin with, love to go on with and love to end with, the purity and intensity of love varying, of course, with the progress a devotee makes in his journey on the inward and upward path. Public preaching or propaganda is neither recognized nor allowed in the Radhasoami Faith. The two important doctrines of Sant Mat are (i) Firstly, that Sants generally do not interfere with the well-defined laws of eradication of Karams of Jivas, except in rare and specially deserving cases, (ii) Secondly, Sants do not make their advent here for the fulfilment of worldly desires of Jivas. The practice of Radhasoami Faith (Surat Shabd Abhyas) can be performed in the human frame alone. As such it is also necessary to maintain the human body. You can find the dates of the festivals of Radhasoami Faith, daily Satsang timings and the link to listen to the live Satsang. Given below are the dates of festivals as per Radhasoami Faith in Calendar year 2019. Live Satsang is meant for Satsangis of Radhasoami Satsang, Soami Bagh, Agra only and needs login credentials to access. Satsangs can be listened on Desktop computers, Laptops and all handheld devices like Tablets, Mobiles, etc..
Daily Satsang timings held at Soami Bagh, Agra & Soami Bagh, Varanasi are given below. Note: The timings are approximate and vary slightly with season. When Radhasoami Dayal incarnated on this earth in the form of Param Purush Puran Dhani Soamiji Maharaj, the first Sant Sat Guru, He brought with Him five Surats also known as ‘Nij Ansh’ viz. (i) Radhaji Maharaj, (ii) Huzur Maharaj, (iii) Maharaj Saheb, (iv) Buaji Saheba and (v) Babuji Maharaj. By 1861 all These Surats were present together on this planet. An introduction of all These Surats is given below. The details for each of Them can be found in Their respective biographies. Param Purush Puran Dhani (The Most Supreme and the Most Perfect Being) Soamiji Maharaj is the first Sant Sat Guru and the August Founder of Radhasoami Faith. He was born at Panni Gali, in the city of Agra, on the night of the eighth day of the dark half of Bhadon (Janmashtami), at half past twelve, in the year 1875 of Vikram Calendar (corresponding to night between 24-25th August, 1818 A.D. He was the Perfect Incarnation of Radhasoami Dayal and had made advent in this world to awaken and redeem the Jivas. Read More..
Soamiji Maharaj’s name was "Shiv Dayal Singh Seth". This worldly name of Soamiji Maharaj also has a special significance. Soamiji Maharaj did not descend below the Third Til. Above the third Til is the location of Shiv, hence "Shiv" figures in His name. Shiv is a destroyer. But Soamiji Maharaj was Dayal Purush, the merciful. Therefore, His name was "Shiv Dayal". For destroying Kal and Maya He was like a lion (Singh). Therefore the full name "Shiv Dayal Singh". A rich businessman or a rich person (Dhani) is called "Seth". And Seth is a caste among Khatris. The real wealth is the wealth of spirituality. Soamiji Maharaj was the "Seth" of spiritual wealth. There are 7 letters in Shiv Dayal Singh in Hindi (शि व द या ल सिं ह). When Radhasoami Dayal, the Lord of Radhasoami Dham, which is situated beyond the seven regions of Sahas-dal-kanwal, Trikuti, Sunn, Bhanwargupha, Sat Lok, Alakh Lok and Agam Lok assumed human form in this world, then He came to be known as Shiv Dayal Singh. Soamiji Maharaj was the Incarnation of the eighth region, the highest spiritual region, and was born on the eighth day. Eighth day is the Madhya or middle of a fortnight. Bhadon being the sixth month is the middle of the year. The time of His birth was half past 12 midnight, which is also the Madhya, i.e. the midpoint between 12:00 AM and 1:00 AM. Everything about His birth was thus in the Madhya, i.e. middle or centre. The Lord could not come lower down in the same form as His intense spirituality would have caused destruction to these regions. He had, therefore, to cover Himself with the materials (if the word can appropriately be used) constituting these regions, and had to associate Himself with the subtlest form of the materials to be found there. The subtlest form of the three Gunas’ i.e. ‘Sat’, ‘Raj’ and ‘Tam’, appeared from Trikuti in a formless condition but when they descended from Sahas-dal-kanwal, they had form. Five ‘Tattwas’ also came down from there and thus these 3 ‘Gunas’ and 5 ‘Tattwas’ or elements (5+3=8) constitute the major part of the materials of Brahmand. So the Lord had to assume covers of these regions and it took eight days, as they are eight in number. He had to put on eight kinds of covers. This process took eight periods. Hence the Incarnation of Radhasoami Dayal, i.e., Soamiji Maharaj, manifested Himself on the eighth day of the dark fortnight of ‘Bhadon’. The choice of the Janmashtami day or the eighth day, for His advent, was the natural result of this process. At the tender age of six-seven years, He started explaining Parmarth of the highest order to selected men and women. Soamiji Maharaj had no guru, nor did He receive instructions in Parmarth from anyone. On the other hand, He explained Parmarth to His parents and a number of Sadhus who came to Him. Soamiji Maharaj possessed an extremely handsome appearance and personality and each part of His body was most attractive. He was of middle height, of very fair complexion and of a delicate, yet very proportionate, constitution. His eyes were brilliant and lustrous and His forehead was open and broad. To cast a look at Him was to realize the presence of someone unusually attractive and magnetic. It was not easy for a man to fix his gaze upon Him. To look intently at His eyes was possible only if He was pleased to permit it. Soamiji Maharaj would, for days together, shut Himself up in a small room and remain absorbed in the bliss of Surat Shabd Yoga. There was no knowing when He would need water, food or rest. He ate sparingly. Radhaji Maharaj used to soak a few raisins in water at night, and next morning She would offer that water to Soamiji Maharaj as a mild laxative and distribute the raisins among the children. The food contents of such raisin water can well be imagined than described. But even this meagre quantity was sufficient for Soamiji Maharaj. Ordinarily, one takes food in good quantity, although a very little portion of it is actually necessary for keeping the body fit and going, the rest being wasted. As against this, Sants and Sadhs eat very little and sort the subtle food out of it. By their spiritual power they are able to finish every work very quickly, easily and with perfection, which is not possible for an ordinary man. Huzur Maharaj, one of the Nij Ansh and the second Sant Sat Guru, while performing the practice of Surat Shabd Yoga, heard the sound of Radhasoami emanating from the highest region and upon reaching there found unity of Radhasoami Dayal and Soamiji Maharaj. Then he started addressing Soamiji Maharaj with the same name i.e. ‘Radhasoami’. Gradually the Updesh (Initiation) and Abhyas (spiritual practice) of Radhasoami Nam and Dham was commenced. At this time, a few men and women came to Soamiji Maharaj and, greatly impressed with His Darshan and discourses, became His devotees. This gathering kept on increasing day by day and it is to this group’s deserving Jivas that Soamiji Maharaj gave the secret of Radhasoami Nam. And these deserving Surats, having high spiritual status, started addressing Soamiji Maharaj by the same name. Soamiji Maharaj started holding Satsang at His residence on Basant Panchmi day in Samvat 1917 Vikram (Friday, the 15 th February, 1861). This Satsang continued day and night for seventeen and a half years. Sometimes discourses, which began in the evening, continued till midnight or even next morning. About ten thousand persons were initiated into Radhasoami Faith. They were mostly Hindus, from different provinces (States). Some Mohammedans, Jains and Christians were also initiated. Soon the fame of the new and unique faith of Soamiji Maharaj spread everywhere, far and near, and people from Agra and other places started coming to listen to the discourses of Soamiji Maharaj in large numbers. These included Christian priests and Sadhus of various sects. Many of them held discussions in groups with Soamiji Maharaj, and would go fully satisfied with the Bachans (discourses) of Soamiji Maharaj. By disclosing the practice of Surat Shabd Yoga, the Supreme Being Radhasoami Dayal has made the method of meeting Him so easy that the difficult practice of restraining breath has been totally stopped. He prescribed such a practice, that an old man of 80 years, and a young boy of 8 years, can also perform it. "Sar Bachan Radhasoami Poetry", which is also called "Bari Bani" (Great book of Hymns), was dictated by Soamiji Maharaj Himself. In 1861, on the commencement of general Satsang on Basant Panchmi, Soamiji Maharaj commenced the writing and dictating of Hymns. Most of the time this Sewa was taken from Lala Jiwan Lal Ji. But sometimes Soamiji Maharaj used to take this Sewa from Huzur Maharaj also. Soamiji Maharaj would dictate and Lala Jiwan Lal Ji and Huzur Maharaj would keep writing it down. As is apparent from the name itself, this book is filled with invaluable essence of discourses. These have been uttered by the Supreme Being Radhasoami Dayal Himself. This book has more than 200 Arabic words and about 100 Persian words. How can one describe its glory? The compositions are filled with high Spirituality and deep knowledge. When one withdraws one’s attention from outside and concentrates one’s Surat and mind within to some extent and then reads or listens to the Hymns, one will derive its complete bliss. Soamiji Maharaj’s Hymns are of a very high spiritual level and are full of the glory of Radhasoami. From the beginning to end, it has been said that Radhasoami Nam and Radhasoami Dham are above all and the highest. "Sar Bachan Radhasoami Prose" which has discourses was also dictated by Soamiji Maharaj Himself. Soamiji Maharaj had spoken to Huzur Maharaj about His departure about two years before hand. Upon Huzur Maharaj’s repeated prayers to Soamiji Maharaj for the suspension of that Mauj, Soamiji Maharaj agreed to retain His mortal coil for some more time. After some time, when again Soamiji Maharaj stated that He would leave the mortal coil after five days, Huzur Maharaj was deeply saddened and felt very sorrowful. Huzur Maharaj again pleaded that if such a Mauj is not ordained now, it will be great Daya (kindness) on Jivas. On this, Soamiji Maharaj stated that this physical body has become decrepit and it is not acceptable to retain it. Huzur Maharaj again requested that Daya may kindly be shown for a few days more. On this, Soamiji Maharaj accepted the request to maintain His physical body for another fifteen days, but said that such a request should not be made again because if I refuse, My heart does not feel like saying no and it also does not appear proper to keep this human body any longer. After fifteen days, on Asad Badi 1 (Padwa), Samvat 1935 Vikram, Saturday, 15 th June 1878, after getting His Arti performed by Huzur Maharaj and other Satsangis and Sadhus, He departed at about 1:45 pm in the afternoon. On the departure day, at about 8 A.M., Soamiji Maharaj observed that the time of His departure was then near at hand. Thereafter, Soamiji Maharaj withdrew His Surat (spirit) and also all diffused spirituality. A quarter of an hour later, He brought down His Surat and then declared that "Mauj has now changed and there is still some time". Then Lala Pratap Singh (youngest brother of Soamiji Maharaj) enquired "When is the Mauj now?" Soamiji Maharaj replied, "Sometime in the afternoon". Then Sudarshan Singh enquired to whom one should refer one’s Parmarthi queries. Thereupon, Soamiji Maharaj replied, "Whosoever has anything to ask, must refer it to Salig Ram (Huzur Maharaj)". Thereafter He said, "No Satsangi, whether a house-holder or a Sadhu, should worry at all. I am constantly with everyone, and greater care of all will be taken in future ....... Satsang must go on. Satsang shall spread far and wide in future". Annual Bhandara of Soamiji Maharaj was fixed by Huzur Maharaj as Asad Badi (Padwa) for first 50 years. Then onwards, the annual Bhandara is being held on Bhadon Badi (Janmashtami) as fixed by Babuji Maharaj, the fourth Sant Sat Guru of Radhasoami Faith. Read Less..
Radhaji Maharaj was one of the Nij Anshas that Soamiji Maharaj brought along with Him. But She did not function as a Sant Sat Guru. However, Her role was quite significant. Radhaji Maharaj's name was Narain Dei. At the time of marriage Soamiji Maharaj said of Her that by virtue of Her high spiritual status and affinity to Him, She was destined to be with Him; so let the marriage be performed. Later on, He said that She was a Nij Ansh and came with Him from the August Abode; She was Nij Adi Radha Dhar. So She should be addressed as Radhaji. Read More..
On seeing Soamiji Maharaj's countenance, Radhaji Maharaj became oblivious of Her body, mind and everything. Soamiji Maharaj alone was Her life and support. Soamiji Maharai used to explain Parmarthi matters of the highest order to Radhaji Maharaj, when she had come to Agra, after marriage. She heard His discourses in Satsang as well. Soamiji Maharaj would, for days together, shut Himself up in a small room and remain absorbed in the bliss of Surat Shabd Yoga. There was no knowing when He would need water, food or rest. It was also not certain at what time of day or night, He would require anything. So, Radhaji Maharaj had to be in attendance on Him all the time, if not physically, at least mentally and spiritually. Amid the hustle and bustle of Her multifarious duties and activities, Her attention was always riveted on Soamiji Maharaj and His requirements. It was Radhaji Maharaj alone who could do this. Though fully devoting Herself to Parmarthi activities, there was no letup in the discharge of Her multifarious household duties. A very cool and serene current was present in Her. She had not assumed the human form just to do the household duties, though She would be seen to be busy preparing food for the family and Satsangis and doing similar things. She Was a Nij Ansh (special emanation) of Radhasoami Dayal. She was a most powerful cool current personified. To an important question, "Whom have you appointed to look after and guide us?" Thereupon Soamiji Maharaj replied, "Radhaji for ladies and Sanmukh Das for Sadhus". Ladies should not go to the garden (Soami Bagh) to serve and pay respects to any Sadhu. They should all worship Radhaji and have Her Darshan. Addressing Rai Salig Ram (Huzur Maharaj), all Sadhus, Satsangis and Satsangins, Soamiji Maharaj observed, "You should give Radhaji the same place in your estimation as you gave me, and should treat Radhaji and Chhoti Mata Ji alike." Radhaji Maharaj had not any function assigned to Her as in the case of the Gurumukh. Her mere presence was enough to ensure the fulfilment of the mission for which She had come with Soamiji Maharaj. Being the embodiment of Adi Surat (the prime Spirit-Current), She had a special love for and affinity with the spirit entities in these regions and exercised a peculiar attractive influence on them. This expedited their emergence from the stress of mind and matter. Radhaji Maharaj survived Soamiji Maharaj by more than sixteen years. During these years She nursed the Satsang started by Soamiji Maharaj and saw that His successor Huzur Maharaj did not meet with opposition from the members of Her family and others. An eminent author/compiler of Chadu Panchang (almanac), has, on the basis of Soamiji Maharaj's horoscope, calculated Radhaji Maharaj's date of birth as Ashwin Sudi 5, Samvat 1884 Vikram, corresponding to Tuesday, the 26 th September 1827, but nothing can be said about its accuracy. She departed from this world on November 1st, 1894. Her ashes are kept with those of Soamiji Maharaj in the Holy Samadh at Soami Bagh, Agra. A small portion is also kept in Radha Bagh. Radhaji Maharaj's Bhandara was held on Saturday, 1 st December 1894, in Agra. Buaji Saheba was also present on that occasion as is evident from one of the letters of Huzur Maharaj to Maharaj Saheb. Read Less..
Huzur Maharaj was the second Sant Sat Guru of the Radhasoami Faith. He succeeded Soamiji Maharaj. Huzur Maharaj was born at half past four in the morning on Friday, the 14 th March 1829, at Pipal Mandi, in a Kayasth family. Kayasth literally means, "situated in the body, the Supreme Being or Spirit". The duration of pregnancy in woman is usually nine months. Huzur Maharaj was however, born after eighteen months and the body too was developed as of a child of eighteen months. But nothing unusual was felt by the revered mother. Read More..
Huzur Maharaj's name was Salig Ram. He had his early education in a Maktab (primary school for boys) where he acquired proficiency in the Persian language. No University having then been established, he passed the Senior Examination in English from the Agra College, Agra. It was the highest degree in those days. Huzur Maharaj took interest in Astrology, Logic, Theology and Philosophy as well, which he studied as hobbies. He used to explain intricate and subtle points of Astrology with such felicity and clarity that left the listeners wondering. He translated Sanskrit books of Astrology into Persian, and thus made this science available to Persian-knowing people. The spiritual instinct of Huzur Maharaj had begun to manifest itself in his very childhood. When according to the custom prevalent in his community, he was required to take initiation from the family guru, the Gosain of Mathura Bindraban, at the age of eight or nine years, he put to him some intricate questions which the latter could not answer satisfactorily. Huzur Maharaj refused to have him as his Guru. However, when pressed, he agreed on the condition that whenever he found out a true and perfect adept, he would be free to accept him as his Guru. The first memorable meeting between Soamiji Maharaj and Huzur Maharaj took place in 1858. A Sunday was fixed for the interview. Huzur Maharaj came in the morning. Soamiji Maharaj cordially seated him in the same room where He used to perform Abhyas and which is inside another room. Huzur Maharaj related all about himself and asked several questions on Parmarth (religion), to which he received very satisfactory answers. This first audience lasted for nearly five hours. On coming out, Huzur Maharaj broke forth that he had found the One whom he had been seeking for so long. He added that since his very boyhood be had been praying, 'O my Lord! meet me Thyself'. His prayer had been granted, He had met the Supreme Being Himself. The family of Huzur Maharaj consisted of religious-minded persons with catholic virtues. His Father Munshi Bahadur Singh, a lawyer by profession, was a great devotee of Shiva. He kept with him only as much as was needed to meet the household expenses. Rest, he gave away in charity. So would Huzur Maharaj place his entire monthly emoluments at the Holy Feet of his Guru, Soamiji Maharaj. Huzur Maharaj's mother was a good natured, intelligent and pious lady. After the demise of Huzur Maharaj's father, she brought up and educated the children astonishingly well. Huzur Maharaj's was a full-fledged household life with large progeny and great fortune, entailing at the same time, equally great responsibilities and burdens. Even amidst the hustle and bustle of such a life he performed devotion, singular in its kind, to Soamiji Maharaj. Huzur Maharaj, in general appearance, was well built above medium height and graceful in gait and speach. His refulgent forehead, flowing beard, uplifted eyes and beatific countenance struck men at once with reverence and love. He exercised an irresistible personal charm and attraction on all those who came in contact with Him. The whole atmosphere of the place in which He lived was surcharged with love and attraction which even a casual visitor would feel and realize. He was generous and benevolent to the extreme, just as a mother is to her children. Huzur Maharaj's place was verily a perennial source for the flow of spirituality from the feet of the Supreme Father to this arid and barren part of creation. At the age of 18, Huzur Maharaj entered Government service. He got an appointment in the office of the Postmaster General. He was deputed to Saharanpur in 1850, and then to Allahabad in 1851, on special duty and in recognition of his good work, was made, on 1 st April 1852, an Inspecting Postmaster. On 1 st July 1852, Huzur Maharaj was made the Head Assistant in the office of the Postmaster General. In 1868, Huzur Maharaj was promoted as Personal Assistant to the Postmaster General and on 31 st August 1871, the title of Rai Bahadur was conferred on him as a mark of personal distinction. He was, since then, known in official circles as Rai Salig Ram Bahadur. On the 28 th April 1881, he had the unique honour of being the first Indian to be made the Postmaster General of the North Western Frontier Provinces which then included Uttar Pradesh, Punjab, Rajasthan and Madhya Pradesh. Huzur Maharaj's name is still remembered in connection with the introduction of one-pice post card and is associated with many reforms relating to cheap postal services and facilities of which the inhabitants of poor and economically under-developed countries like India could take full advantage. He was recognized as the beacon light of truth, virtue and efficiency in the department. Throughout his career, Huzur Maharaj won praise and admiration everywhere. Although almost the whole of his time and attention were devoted to the service of Soamiji Maharaj, there was not the least deterioration in the quality and the magnitude of the work entrusted to him as an important and high officer of the postal department. Without a single mistake, He discharged his duties well. He moved from one department to another, accepting added responsibilities with cheerfulness and efficiency. In consideration of his distinguished services, his excellent conduct, the Secretary of State for India, granted him a special pension. Huzur Maharaj, throughout his service career, experienced special grace and mercy of Radhasoami Dayal. Often, while on tour, he had to pass through dangerous routes, forests and hillocks, and cross swollen rivers and brooks, at any hour of the day or night. But the protecting hand of Radhasoami Dayal was always on his head. Huzur Maharaj was in Soamiji Maharaj's Satsang for about twenty years during which period he served His Guru with His body, mind and riches with singular loyalty and singleness of devotion of which it is impossible to find a parallel. For a long time he used to fetch a pitcher of pure water on his shoulder for Soamiji Maharaj from a well two miles away. For this he walked barefooted on the stone pavements in hot summer of May and June. He used to grind flour for Soamiji Maharaj's bread. He used to press the feet, operate manual fan, fill the Huqqa, cook food, bathe Him, clean and paint the house, pluck twigs from Neem trees to be used as brush, clean toilet & drain, wash dishes, bring goods from the market, lift Him on his shoulders, carry the palanquin, run with the vehicle, offer spittoon, handle the whisk etc. He used to dig deep to get clean earth for washing His hands. Every morning he used to sweep the rooms and verandahs of Soamiji Maharaj's house. He performed all kinds of high and low services. All these gave him pleasure and satisfaction. Huzur Maharaj performed these Sewas (services) with a verve and gusto that was a pure joy to watch. Huzur Maharaj attended on Soamiji Maharaj from twelve to fifteen hours a day. After the establishment of General Stasang in 1861, when Soamiji Maharaj took up the composition of Sar Bachan Radhasoami Poetry, Huzur Maharaj would take down dictation for hours together. He would also attend on Soamiji Maharaj's correspondence. The historic letter given in chapter 27, Biography of Huzur Maharaj, was written by Huzur Maharaj under instructions from Soamiji Maharaj. Soamiji Maharaj had ordained that, in future, Satsang would spread far and wide. This exactly happened in the time of Huzur Maharaj. On His retirement from Government service, when Huzur Maharaj held Satsang at Agra, thousands of people received initiation into Radhasoami Faith. They flocked from every part of India, viz., Bengal, Punjab, Sindh, Deccan, Rajputana, Bombay, Central India, etc., and received spiritual benefit. Satsang was held several times during day and night. Huzur Maharaj's discourses were very sweet and impressive. He used to reveal the secrets of Radhasoami religion in such a unique and new manner every time that the audience was wonder struck. Sometimes persons would come in batches at different hours and Huzur Maharaj would discuss religion with each of them in entirely different manners, from different view points and in new and varied forms. A listener would, at once, become His slave. Adhikari Jivas were coming over from long distances as if under a magnetic pull. Satsangis used to get many experiences of grace, mercy and protection, but were forbidden to disclose them to anybody. "It is the pleasure of the Supreme Being that whatever He does by His grace and mercy should not be made public. It, therefore, behoves a true Parmarthi not to speak out to anybody about the grace which he experiences internally or by which his affairs are satisfactorily managed. He should offer thanks to the Supreme Being internally. Of course, he is not prohibited from giving indications of such experiences to Parmarthis and loving devotees on some special occasions, because they also have experiences of such grace and mercy and Mauj in their own affairs". He was all-powerful. He showed that no one can know the secrets of Sants unless They themselves are pleased to impart the same to Jivas. Huzur Maharaj used to give very patient hearing. Satsangis would often relate their petty household affairs. But Huzur Maharaj would never scold anybody. At the most, He would say, "Brother, you are talking about such a proposition that nothing can be said". Anger was miles away from Him. He used to take very little rest. All the time He was busy in holding Satsang, delivering discourses, explaining Parmarth to new entrants, dictating replies to the letters of Satsangis, Bachans of Prem Patras. Huzur Maharaj used to put on different types of dresses. It was really a wondrous sight to see Him in coat and cap made of velvet with embroidery work on them, walking down the incline, on His way to Panni Gali, with His hand resting on the shoulder of Maharaj Saheb and Satsangis following in procession. About a week before His departure, Huzur Maharaj strolled a few rounds in the verandah of Prem Bilas, casting His gaze on the Satsangis present. Someone said, "Today Huzur's health appears to be better. Huzur Maharaj observed, "Sants are great Thagias (masters at befooling)". On the evening of 6 th December at 6:40 PM, Huzur Maharaj enquired as to what time it was then and ordered the pillows and bolsters to be arranged on the bedstead. And after five minutes He left his mortal coil. His eyes were shining and face was lustrous and refulgent. Huzur Maharaj's body lay in state for three days to allow numerous Satsangis from far off places to have a last glimpse of Him. Huzur Maharaj's Samadh was built in Prem Bilas exactly on the spot where He left His mortal coil. His first Bhandara was held on 27 th December 1898. A large number of books, big and small, and treatises in prose and verse, were written to the dictation of Huzur Maharaj, all printed and published in His time. They can be classified in four categories viz. (i) Prem Bani in verse, (ii) Prem Patra in prose, (iii) Booklets in Hindi and Urdu and (iv) Radhasoami Mat Prakash in English. Read Less..
Maharaj Saheb was the third Sant Sat Guru of Radhasoami Faith. He was born in Piyari Kalan, Kabir Chaura, Varanasi, on Thursday, the 28th March 1861. Maharaj Saheb's name was Brahm Shankar. Huzur Maharaj had given Maharaj Saheb the Parmarthi name 'Premanand'. Read More..
Maharaj Saheb was born in a highly respected Brahmin family of intellectuals. A deep religious inclination and a broad and independent outlook required for spiritual advancement were not lacking in it. This is borne out of the fact that His father Pandit Ramjasan Misra, though belonging to a staunchly conservative family of Sanatani Brahmins accepted a famous Muslim Fakir of Patna as his Guru without any fear or opprobrium. Maharaj Saheb got married at a very early age. His consort was just nine at the time of marriage. She was younger by six months to Maharaj Saheb. She was called ‘Naiyaji’ .Huzur Maharaj had given the Parmarthi name 'Shabd Pyari' to Naiyanji. One day Naiyanji prayed to Huzur Maharaj to deliver a discourse. Huzur Maharaj replied, "Don't worry, you will be having discourses at your own house," adding "the next Sant Incarnate will be in a Brahmin family." According to the traditions of the time, Maharaj Saheb paid much attention to body building, performed a lot of physical exercises. He was a great athlete and a wrestler, ready to challenge any and everybody. The bad characters and even policemen of Kashi (Varanasi) feared him. In contrast, Babuji Maharaj was lean, thin and short statured. But, because both of them always moved together, people feared Babuji Maharaj too and no one dared raise a finger against him. Maharaj Saheb had a liking for music also. He played Sitar well. Whenever His father had a spell of heartache, He would play Sitar which would lull him to sleep. At B.A, Maharaj Saheb had English Literature, Sanskrit and Physics as His subjects. He took His M.A. degree in English literature in 1884. 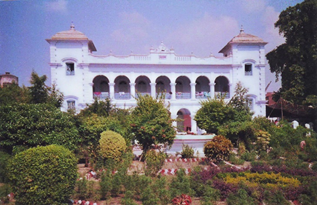 On completion of His education, Maharaj Saheb joined Bareilly College as a teacher. He also commenced the study of law, but soon gave it up as the lawyer's profession did not suit His temperament. Actually, the time for His joining the Satsang had come. The first meeting of Maharaj Saheb and Huzur Maharaj was momentous. Maharaj Saheb and Babuji Maharaj went to the railway station to receive Huzur Maharaj. Maharaj Saheb stood leaning against a lamp post waiting for the train to arrive. The train steamed in and gradually came to a halt. Huzur Maharaj was standing at the door of His compartment. No sooner Maharaj Saheb had Darshan (glimpse) of Huzur Maharaj, than His Surat was so "strongly withdrawn towards the third Til, that He was about to fall but Babuji Maharaj lent Him support. Maharaj Saheb stood leaning against the lamp post. Maharaj Saheb was feeling the infusion of a strange power in Him. He was having a new experience, which He could neither comprehend nor unfold to others. A sort of electric current was flowing in His body. After having adopted Huzur Maharaj as His Guru, Maharaj Saheb had practically withdrawn His attention from the world and all that it stands for. That worried His mother very much. She often used to say that her Munua had stopped eating and drinking everything. What sort of Guru he has adopted that there is no knowing what might happen to Him. Maharaj Saheb got appointed as clerk with Accountant General's Office. Within six years of His appointment, Maharaj Saheb became a Superintendent. In 1905, He was promoted as Chief Superintendent. This was the highest position in that department which one could expect in those days. He held this post till He took leave preparatory to retirement. His promotions to the post of Superintendent and Chief Superintendent were out of turn and in supersession of His seniors. In fact, His unusual abilities entitled Him to much higher promotions but He never courted them. On the other hand, His perfect contentment, His total exclusiveness and indifference to all matters except what strictly constituted His official duties and the desire to remain as near to His Guru as possible, were some of the reasons why He was not promoted to class one of the Indian Audit and Accounts Service. His superior officers agreed to give Him only what He could accept in the above circumstances. He served for 20 years and received promotion after promotion. He was nominated for Deputy Collectorship which He declined. Maharaj Saheb used to hold Satsang three times a day, early morning, evening and night.The audience consisting of both males and females numbered from three to seven or eight hundred. Discourses were almost invariably delivered at each divine service and their fame spread far and wide. Abstruse spiritual truths were elucidated on strictly scientific lines. The supernatural flow and eloquence combined with the irresistible logic of His discourses held the audiences consisting mostly of educated men spellbound. They all listened with rapt attention and a feeling of deep veneration. Thousands of persons were initiated by Him into the principles of Radhasoami Faith. A new element of discipline and regimentation was introduced by Maharaj Saheb. Satsang was to commence punctually irrespective of the change in the season both in the morning and in the evening and sometimes at midnight also. Maharaj Saheb delivered discourses almost every day and sometimes more than once in the day. The duration of each Satsang was quite long and the audience was large and varied. There were separate places for seating men and women and a separate shed for the children and their attendants so that they might not disturb the Satsang. During Huzur Maharaj's time, signs had begun to make themselves visible of a desire on the part of certain sections of Satsangis to form themselves into separate groups and of the assertion by certain persons of the right of interest in properties which had by that time come into the possession of the Satsang. In order to check this disruptive tendency as also to obviate the difficulties which might arise during the periods intervening between the succession of Gurus and to maintain the undisturbed continuity of the management, Huzur Maharaj wanted to create a body to administer for all time the property of the Satsang under the guidance of the Sant Sat Guru. In fact, a rough scheme had been drawn out for the purpose. But before it could take a concrete form, Huzur Maharaj departed from this world. This work was taken up in right earnest by Maharaj Saheb in 1902 resulting in the creation of a body called the Central Administrative Council and its adjunct, the Radhasoami Trust, whose headquarters are located at Soami Bagh, Agra. With the assemblage of a large number of persons with varied spiritual outlook and ambitions, schisms are inevitable, but the organic unity of the parent stock, which is the custodian of and maintains the original principles and teachings of the Founder in their pristine purity, remains unaffected under the aegis of the Sant Sat Guru assisted by the Central Administrative Council established by Maharaj Saheb. The parent stock consists of persons whose ideals are to engage themselves in spiritual pursuits uncontaminated, as far as possible, with the ambitions of the world .Their aim is to reduce their worldly engagements to a minimum, more or less confined to such as are needed to maintain themselves and their families in decency and to help the needy and the poor when occasion arises. 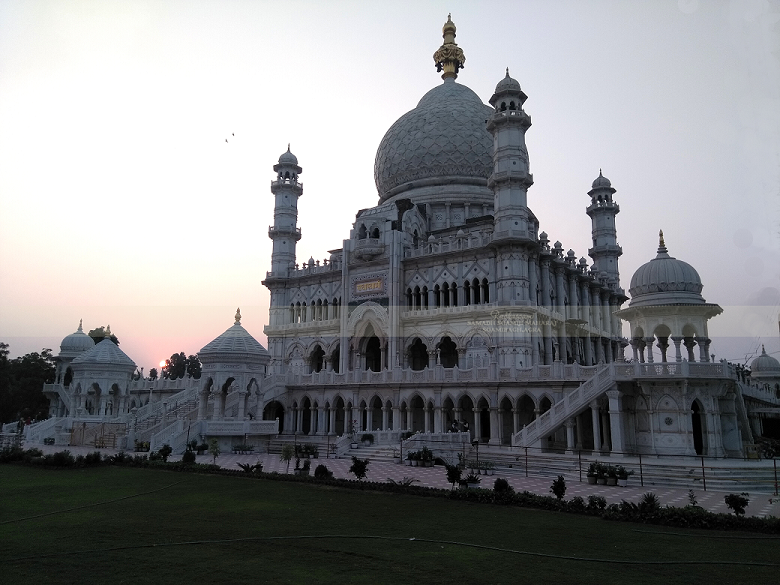 The idea of erecting a magnificent and stupendous Samadh building befitting the memory of the August Founder of Radhasoami Faith, originated with Maharaj Saheb. Maharaj Saheb started dictating the English book "Discourses on Radhasoami Faith" in 1907. Mr. Cooper used to note down the dictation. Babuji Maharaj would touch up and read it out to Maharaj Saheb. Due to Maharaj Saheb's indifferent health the dictation of this book had to be stopped off and on, ultimately when His health broke down, He altogether stopped dictating what had yet to be done on the book, as also revising the already dictated material. After having dictated these basic principles Maharaj Saheb stopped further dictating the book. The apparent reason was His failing health. The book was later published by Babuji Maharaj. His discourses during Satsang are compiled in the book 'Discourses of Maharaj Saheb'. Nearly a century ago Maharaj Saheb had in one of His discourses predicted that in future, Satsang would be telecast in such a manner that Satsangis all over the world would be able to hear the discourses of the Sant Sat Guru and have His Darshan at the touch of a button. sleep and appetite begin to wane. When Maharaj Saheb's end drew near, Naiyanji had said, "Who will look after us? "Maharaj Saheb raising His hand skyward, said thrice, "Radhasoami, Radhasoami, Radhasoami". Maharaj Saheb departed on Saturday, the 12th October 1907 in Soami Bagh, Benaras. The hall in Soami Bagh, Varanasi, where Satsang is held now-a-days, was under construction in Maharaj Saheb's time, and the same was converted into His Samadh after His departure. Read Less..
Buaji Saheba was the elder sister of Maharaj Saheb. She was senior to Maharaj Saheb by four years and functioned as the fourth Sant Sat Guru of Radhasoami Faith. Her actual name was Maheshwari Devi. Buaji Saheba's father's house and father-in-law's house were both located in the same locality of Varanasi, called "Bari Piyari". Read More.. Very shortly before His departure, Maharaj Saheb in one of His last discourses (public utterances) in open Satsang, declared in the presence of a large number of people that the 'Nij Ansh' or a direct emanation from the Supreme Source endowed with full spiritual powers, existed at the time in the body of a female and further exhorted that all should direct their devotion to Her instead of trying to find a successor in one or other of the Satsangis. He added that though She, owing to Her being in a female garb, would not be able to discharge the functions in full, of an Acharya of the Mat, yet She would accord internal assistance necessary for the spiritual advancement of Her devotees and also give external assistance to some extent. In addition to above, Maharaj Saheb, about a month before this declaration in Satsang, gave out in the presence of few Satsangis that the Nij Ansh existed in His sister Buaji Saheba. In Her old age, Her health was failing day by day and She stayed behind the curtain. It was for a very short time that She presided over Satsang. As such very few people could derive benefit from Her Satsang. After Maharaj Saheb's departure, Buaji Saheba did not agree to function openly for a pretty long time. Satsangis could go near Her and derive benefit from Satsang only when Babuji Maharaj was there with Her. Some Satsangis were exceptions to this rule. They could go and meet Buaji Saheba at any time. Maharaj Saheb often used to say that the next Sant Sat Guru would effect the weeding so that the true and pure Satsang would be left to a small size. After the departure of Maharaj Saheb, the necessary weeding and purging happened in which many people formed their own Guru at a different city and started their own Satsang. Buaji Saheba left Her mortal coil at 12.30 in the night between Tuesday, the 20 th May and Wednesday, the 21 st May, 1913. Read Less..
Babuji Maharaj was the fifth and the last manifest Sant Sat Guru of Radhasoami Faith. Babuji Maharaj was the last of the Nij Anshas who came in the time of Soamiji Maharaj. His life on earth coincided practically with the growth of Radhasoami Satsang established in 1861, the year of his birth. His association with the Satsang was the longest of all. So, with His departure at the ripe age of 88, closed the biggest chapter in the history of Radhasoami Satsang. Read More.. In the early hours of Wednesday, the 19 th June 1861, Babuji Maharaj was born as a grandson to the elder sister of Soamiji Maharaj, at Varanasi (Benaras). Babuji Maharaj's name was Madhav Prasad Sinha but, out of love and affection, he was called "Raja" (King). In January 1874 Soamiji Maharaj initiated Babuji Maharaj in Radhasoami Faith. Huzur Maharaj gave Babuji Maharaj the Parmarthi name of "Prem Adhar". Babuji Maharaj's mother was a great Parmarthi (pious) lady. She always kept Satsang and Parmarth (spiritual welfare) above all worldly pursuits. In the beginning of 1921, Babuji Maharaj's mother passed away. She could neither see nor hear. She was unmindful and oblivious of any physical injury or pain or even bleeding. She remained in this state for quite some time. Often, she would say, "Look! Soamiji Maharaj, Huzur Maharaj and Maharaj Saheb have graced me by their arrival here." At times, she would call Babuji Maharaj and say, "Raja! Should I be lying in bed like this in your presence?" Babuji Maharaj would reply, "Bhabhi! Just remember what Soamiji Maharaj had told you that you have not to be reborn in this world". Babuji Maharaj's father had a big jewellery shop in Kolkata (Calcutta). In a short time, he earned so much that even the utensils of daily use were of silver. Babuji Maharaj's father passed away on Saturday, the 1 st May 1875, at the age of 44, when Babuji Maharaj was only fourteen years. It has been observed that parents of Sants, Sadhs and Mahatmas often die at a young age. Huzur Maharaj's father died when Huzur Maharaj was only four years of age. Babuji Maharaj used to wear long hair during childhood. He was fond of playing upon musical instruments, specially sitar (a kind of guitar). He was very sharp in reading and writing. In the beginning, He was not sent to any school. A tutor used to come to his house to teach him Persian language, in which he was a muntahi (very proficient) and was considered to be a good scholar of Persian even at the young age of 13 or 14 years. Once when Babuji Maharaj entered his class room on the first day, he felt a bit perplexed and was thinking where he should sit, as all the seats were occupied, except one by a robust boy. So robust and sturdy was he, that nobody dared sit near him. This robust and sturdy boy was none other than Maharaj Saheb. As soon as their eyes met, Maharaj Saheb instantly beckoned Babuji Maharaj to sit by his side and added that he should sit with him daily. Maharaj Saheb greeted Babuji Maharaj like an old friend. From that day on, both were seen together all the time. Both were drawn towards each other due to internal attraction, as both had descended from Radhasoami Dham for the same benevolent purpose. Two opposite forces were working upon Babuji Maharaj during his boyhood, the aforesaid atmosphere of Kashi (Varanasi) and the influence of his uncle Sri Shiv Prasad on the one hand and Soamiji Maharaj and His Satsang on the other. In 1884, he obtained the degree of M. A. (Master of Arts) in English Literature from the premier University of Kolkata (Calcutta), as a student of the Benares College. At the age of sixteen Babuji Maharaj was married to Srimati Bhagwan Dei, daughter of Sri Chiranji Lal Seth of Shikohabad (U.P). Huzur Maharaj gave her the parmarthi name of Surat Pyari. She was generally called Maiyanji. Maiyanji means revered mother. Maharaj Saheb and Babuji Maharaj took their M. A. degree in 1884. Thereafter, they commenced the study of law, but soon discovered that a lawyer's profession would not suit them as it requires constant exercise and diversion of mental faculties to mundane affairs, which leave little time for meditation and for the care of the soul. Babuji Maharaj was temperamentally very soft and obliging. He would not mind working for extra hours, if necessary. His sole aim was efficiency. He worked as a Superintendent in the budget section for a long time. Maharaj Saheb himself used to appreciate the ability of Babuji Maharaj. The Accountant General often used to send difficult and complicated cases for drafting and disposal to Babuji Maharaj. Being impressed with the ability and gentle behaviour of Babuji Maharaj, the Accountant General recommended to the Government for the conferment of the title of "Rai Saheb" on him, which was granted in 1914. Since then be came to be known as Rai Saheb Madhav Prasad Sinha. In 1918, when Babuji Maharaj proceeded on leave preparatory to retirement, the office staff was very much grieved. Babuji Maharaj was pleased to observe that he had already written a long letter to the Government of India for enhancing their salary and introduction of time scale of pay. By Mauj, it was accepted. 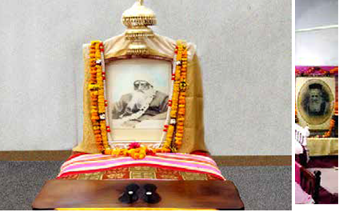 When Maharaj Saheb became Sant Sat Guru, Babuji Maharaj considered Him to be his Guru. He had totally forgotten that Maharaj Saheb was his friend and companion of boyhood. He knew Him to be the Supreme Being personified, and loved Him as such. Babuji Maharaj had always his eyes on the Charans (Feet) of Maharaj Saheb. He performed all sorts of Sewa (service), high and low. He had, in fact, merged his entire existence in Maharaj Saheb. If he purchased anything from the market for his personal use, as for instance, apparel for wearing, he would first purchase it for Maharaj Saheb. Formerly, the members of a certain low caste were not allowed to enter the Samadh of Soamiji Maharaj. When Babuji Maharaj came to know of it, He ordered that no one should be denied entry into the Samadh. Casteism should be kept away from here. All should get an opportunity to pay homage at the Holy Samadh. From that day onwards, all people are allowed free entry into the Samadh. There was a large collection of discourses, which were noted down and reproduced from memory, after they had been delivered by Babuji Maharaj in Satsang. Babuji Maharaj ordered their publication. The manuscript was sent to the press on the 19 th August 1945, and by His grace, after complete one year, i.e. on the 19 th August 1946, which was the day of the annual Bhandara of Soamiji Maharaj, the three volumes of Bachans or discourses were out. The fourth volume came out on the 16 th December 1946. Babuji Maharaj used to read the daily papers, magazines, etc. till the end of 1940. Gradually He stopped doing so, and asked His personal assistant to read out the same to Him.Babuji Maharaj was lying in bed for six and a half years. He neither ate anything nor sat or stood up. He could not change sides on the bed without help. All that He took in 24 hours was just a little milk. A Satsangi had posed the question, "When Saints do not have any Karams, why do they fall ill? It is true that they may not be feeling any pain or restlessness or undergoing any suffering, yet to the outward appearance it looks as if the body is suffering trouble and pain. What is their Mauj and purpose behind all this?". Babuji Maharaj replied, "the Karams of the creation are reduced". Babuji Maharaj had no particular disease, except weakness due to old age, and cough, which increased or decreased with the change of season or weather conditions and due to which sometimes temperature also rose. He could not get up from bed due to weakness. In comparison to 1943, His condition was much better in later days. As regards His daily food, it was meagre even during His youth. But during illness it was almost nil. Still He listened carefully to the prayers of Satsangis. At 10 or 11 in the forenoon, Satsang account books were daily read out to Him. Letters of Satsangis were read out to Him and He used to give instructions regarding replies. He attended to the affairs of Satsang and Satsangis, which were brought to His notice. Satsangis had several opportunities during day and night to have His darshan. Out station Satsangis also visited Soami Bagh more often than before for having the maximum benefit of darshan and Satsang during the last days of Babuji Maharaj when He also, in His august Mauj, had opened the doors of unbounded grace and mercy. Babuji Maharaj remained, for the most part, in a state of concentration and withdrawal. He would bring down the spirit current for a little while and that too in a very small measure. Babuji Maharaj was continually enhancing the flow of His ambrosial grace and mercy as the time of His departure to Original Abode was drawing nearer and nearer. This flow of grace and mercy was there for ever but its form was different at different times. To any request or prayer made to Him, He would always say, 'yes'. He agreed to whatever was pleaded before Him. After His departure, the first Bhandara of Babuji Maharaj was held on Sunday the 23 rd October 1949 in Soami Bagh, Agra. Babuji Maharaj's ashes have been enshrined in the Cremation Memorial in Radha Bagh, and also kept in His room in Soami Bagh. At both these places Satsangis pay obeisance. Read Less.. In the Radhasoami Faith, great is the importance of the Sant Sat Guru of the time. In the absence of a manifest Sant Sat Guru, Huzur Maharaj has indicated the course of action for sincere devotees in Prem Patra, Part 2, Bachan 11. Some extracts from it are given below: "According to the teachings of Sants, the Jiva must attend Satsang once or twice every day till his delusions are somewhat removed. It is a great boon if he luckily gets to Satsang of Sant Sat Guru or Sadh. Otherwise, he should read and study, carefully and attentively, the scriptures of Sants, once or twice daily. Even this would be very beneficial	and his ignorance and misunderstanding would be gradually removed, Whenever he can conveniently do so, he should make it a point to visit the head-quarters Satsang at Soami Bagh once or twice a year, or once in two or three years, and stay there for at least a week or two or for a longer duration. He should utilize this opportunity for removing his doubts and misunderstandings and also the impediments and obstacles which hamper his Abhyas (devotional practices). " "Even attendance at the Satsang is not possible without grace and mercy. Radhasoami Dayal, in His grace, fulfils the desire of sincere Parmarthis as and when He considers it proper. Now and then, He creates circumstances favourable for the ardent Parmarthis to attend Satsang and derive benefit therefrom. If no such opportunity is available by Mauj, they are brought in contact with some high class Satsangi from whom they hear spiritual discourses so that they may also begin to progress on the path of salvation. It, however, behoves all Parmarthis to engender an intense longing for visiting Satsang, and to do all they can to achieve this." You can explore the complete collection of books in available languages here. Note: In case of mobiles and laptops, few browsers do not support 'Open/Play online' feature. Hence clicking on play online will result into download of the content on laptop or mobile. It can then be accessed locally. Note: Set all search criteria to blank, keep the search box blank and click Search button to reset the table. Here you can find the complete collection of audio rendetions (by Satsangis) of (i) Discourses, poetry of all Sant Sat Gurus of Radhasoami Faith and (ii) Poetry of other Sants. The rendetions are in Hindi language. In the table below, you can listen to the audio rendetions (by Satsangis) of Discourses of all Sant Sat Gurus of Radhasoami Faith. The rendetions are in Hindi language. In the table below, you can listen to the audio rendetions (by Satsangis) of Poetry of Sants of Radhasoami Faith. The rendetions are in Hindi language. In the table below, you can listen to the audio rendetions (by Satsangis) of Poetry of Sants of other Faith. The rendetions are in Hindi language. You can explore the video clips related to Sant Sat Gurus and the various events of Radhasoami Faith. You can explore the video poetry (Hymns) related to Sant Sat Gurus of Radhasoami Faith. These videos play the recitition of the hymn and also displays synchronized words in English, Hindi & Romanized text. It will help a Satsangi to recite the hymn along with the words. You can browse through and listen to the Old Satsangs of 1970s and the subsequent Centenary Satsangs. These Satsangs will give you an idea as to how the Satsang was conducted at that time. The lead pathi (reciter) was Sh. Gauri Shankar Shukla. Bachans were read by Sh. Hira Lal ji and Roop Narain ji. This section also has Centenary Satsangs of Soamiji Maharaj (1978), Huzur Maharaj (1998), Maharaj Saheb (2007) and Buaji Saheba (2013). The key Holy Places of Radhasoami Faith are located in Agra and Varanasi (Benaras). Details of the Holy Places are given below. Soamiji Maharaj had His residence in the city. On account of charities and alms-giving, His house was all the time surrounded by beggars and mendicants whose number went on increasing. This caused much inconvenience and disturbance in Satang. Therefore, He decided to shift to some place outside the city. He stayed in several bungalows and houses in the outskirts but did not have the Mauj of a sojourn for more than 8-10 days in any one of them, as none of them was to His liking. Then He started moving out of the city at some distance away on Sukhpal (palanquin) which the Sadhus and Satsangis used to carry on their shoulders and visited various sites in the vicinity of the city of Agra. Finally, He approved a site, about three miles north of the city. There, He laid the foundation of a Bagh (garden) called Radhasoami Bagh or Soami Bagh. Read More..
At this site there was a piece of elevated land in the centre. Soamiji Maharaj took His seat there. He ordered the water of the well, already existing there, to be fetched for Him. On tasting it, He called aloud to Huzur Maharaj by His name and observed that it was really good water. Soamiji Maharaj had sanctified the water of this well. The main portion of Soami Bagh land was taken in the name of Soamiji Maharaj on November 9, 1876 at a lease rent of Rs.12/- per year. Later the entire land of 5 Bighas, 16 Biswas including the well (approx 14,500 sq.mts) was purchased at a cost of Rs.200/-. One morning, Soamiji Maharaj was taking a walk in the garden with three or four Sadhus. One of the Sadhus, named Chetan Das, pointed towards a piece of elevated land in the centre, and said that a Kothi (house, mansion) should be built there for Soamiji Maharaj, for which it was very suitable. Soamiji Maharaj observed that a Guru Dwara would stand there. All kept quiet. Nobody could understand the significance of the words. The entire Soami Bagh is a sanctuary for Satsangis because Soamiji Maharaj, Huzur Maharaj, Maharaj Saheb and Babuji Maharaj walked here. It is for this reason that once Babuji Maharaj was pleased to observe thus - How excellent is the water of this well (in Soami Bagh). It is as healthy as Ghee (clarified butter). Children playing, sporting, frolicking, walking, racing etc. in this garden (Soami Bagh) is as good as performing Abhyas or the devotional practices. Read Less..
Holy Samadh is located in the premises of Soami Bagh, Agra. The construction of Samadh started in 1904 and continued till 1907. It was temporarily suspended from 1907 to 1923. Since 1923, the construction is going on uninterruptedly and the main dome has been completed in 2018. The total height of the whole structure is 193 feet. The four minarets are 104 feet high over the plinth of the main structure. Read More.. The soil in Soami Bagh is sandy and foundations laid on it could not be expected to support the weight of such a massive structure. Hence, it was considered necessary to sink 52 wells to be connected with arches on which to build its walls. The wells are of different sizes, their diameters varying according to the requirements of the main structure in different places, from 5.5 feet to 10.5 feet and depths from 40 feet to 45 feet so as to reach the layer of hard soil, technically called ‘Mota’, in each case. The masonry of the foundation wells consists of bricks and lime. The wells have been filled with brick, concrete and lime. On the top of each well is constructed a base consisting of huge blocks of stones of 6 sq.ft and 2.5 feet thick in two layers. Over the bases, arches of stones 2.5 feet thick, in two cross layers, have been constructed and the wells thus connected with one another. The main structure consists of a hall, 68 feet by 68 feet surrounded by verandahs 15 feet wide on all sides. The width of the walls is 3 feet. The main structure is 110 sq.ft. There is a 55 feet broad platform round it, thus making the whole structure 220 sq.ft. The platform is 15.5 feet above the ground level. In the platform, there are 52 rooms, 13 on each side. The rooms are 10 feet broad but of different lengths. They have been provided with a verandah 8 feet broad. In front of this verandah, all around there is again a platform 10 feet broad with 4 steps all round leading to a 20 feet broad canal having water 5 feet deep. Beyond this canal there will be a road 20 feet wide paved with red sand stone. The floor of the main hall will be exactly 20 feet high above the level of the red sand-stone road. On each of the four corners of the verandahs there is a Burj (pinnacle). In the south west corner, the Burj will meet ‘Bhajan Ghar’, and the platform in front of the verandah of the rooms in the plinth will merge in ‘Bhajan Ghar’ and so also the canal. In order that Bhajan Ghar may remain intact, it is proposed to let the water of the canal flow to its south and west. The sacred well in the garden is considered to be an important relic. It is exactly on the north of the flight of stairs leading to the main entrance from the outer edge of the canal. Another well on the south of the steps has also been made to preserve the symmetry. The first storey of the verandahs is 21.25 feet high and has a gallery 4 feet 7 inches wide jutting into the main hall. This may be especially useful for accommodating ladies at the time of congregational services. The height of the second storey of the verandahs is 20.25 feet at which level the height of the main hall reaches 41.4 feet. At a further height of 14 feet by means of corbelling series of semi-circular arch rings one over the other, octagonal plinth of the dome is formed on the outer side. To form a circular ring above the plinth, masonry in cement on the inside of a total height of 13.25 feet is projected. It is decorated with hill scenery. Here the diameter of the dome is 54.5 feet. The outside of the hill scenery forms the neck of the dome. The second gallery for visitors to go and see the dome work and also for labourers for cleaning etc. has been provided 6.75 feet above the hill scenery on projecting masonry. There is a colonnade of round pillars 11.25 feet high above the foot of the gallery all round it, as though it forms the neck of the inside arch of the dome. On the outside, the base of the dome over the neck is 14.75 feet and the lower outer segment of the dome which is 39 feet high over the basement proper is 11 feet thick of brick in cement in 3 rings with 3 inches thick marble panels on the outside and over this ring rises the cap of the dome 91 feet above the lower semicircular arch. Above this cap there will be a golden copper Kalash 32 feet high. Thus, the The verandah pillars are octagonal in shape. They are marble monoliths 6 feet, 5 inches high and 21 feet in diameter, supported on a carved base 11 feet thick of marble 31 sq.ft and covered with elaborately carved caps 21 feet thick of marble 31 sq.ft. To add to the beauty of the elevation on the north and south, 8 round pillars on each side have been provided on projecting masonry. To give a clear idea of what the structure would be like and for the future guidance of engineers, architects, artists, workers. etc., a miniature model has been prepared. It was completed in June 1928.The scale of the model is 21 feet equal to 1 inch. A look at the model of the building, together with the details given above, and the exquisite beauty of the relief carving in marble and the inlaid stone work done so far, would give some idea of the grandeur of the building, as it will stand when completed. Even as it is, the Samadh and its miniature model are visited by thousands of tourists every day. The building has an oriental setting, but different styles of architecture have been beautifully blended to denote the catholicity of the Radhasoami religion, which has, among its members, peoples of different nationalities. For the same reason, monograms have been provided in different characters, viz. Hindi, Persian and English. In a building of this kind it is natural that construction should go slow, principally due to the elaborate and exquisite marble carving and variegated and exuberant ornamentation, which are the special features of this building. Such work, involving intricate details, cannot be done expeditiously. A single large marble slab, with its skilled carvings of fruit trees, flowers and foliage, takes years to complete it. Ceilings of the verandahs have been constructed with marble slabs 4 inches, 5 inches and 6 inches thick and about 2 sq.ft fitted into one another, without the support of steel or any other girders. The ceiling is certainly a remarkable feat of engineering skill and design. Entire expenditure on the construction of the building is met from spontaneous and voluntary Bhents or offerings by Satsangis, under the administration of the Central Administrative Council, Soami Bagh, Agra. Five or six months after the departure of Soamiji Maharaj, Huzur Maharaj started construction of the Samadh of Soamiji Maharaj on this very spot (of elevated land), which was completed in 1879. This Samadh was very small and simple and was built of red sandstone. When His Samadh was constructed at that spot, it became clear that by Guru Dwara, Soamiji Maharaj had meant His Samadh. Regarding the construction of Holy Samadh of Soamiji Maharaj, Huzur Maharaj was pleased to observe that - "It is very essential and proper that a suitable building be constructed in memory of the August Founder of the Radhasoami Faith and Revealer of Surat Shabd Yoga. This will enable the Satsangis of all the countries to assemble at the headquarters of the Faith where Radhasoami Dayal manifested Himself in the human form. They would meet there at some appointed time. Observing their love and devotion and spiritual progress, they would derive mutual advantage. There, they may also explain and understand the principles of the Radhasoami Faith. Thus, they would strengthen the bond of Love and fellow feeling by cautiously giving out their spiritual experiences. This will augment their love and faith, mutual affection and spiritual unity. In this way, they would all help in the propagation of their unique religion and its easy and unparalleled spiritual practice. For this purpose, there can be no other suitable place than the Radhasoami Bagh (Soami Bagh), where Radhasoami Dayal Himself stayed for some time, where His Holy Samadh has been erected and where His photo and other holy relics have been preserved". When Huzur Maharaj was Post Master General, He used to go off and on to various states for opening new post offices. The Maharaja of Gwalior State gladly made a present of Rs. 10,000/- to Him which He initially refused, but later accepted after approval from the Government. The above sum was spent on the construction of Soamiji Maharaj's holy Samadh and the boundary walls of Soami Bagh. In 1904, for the first time, in His Mauj, Maharaj Saheb conveyed that a magnificent building be constructed. "Just as Radhasoami Faith is a unique Faith to illuminate the entire world with the brightness of its spirituality, where people of all nationalities, all religions are included and can join; the Samadh of Param Purush Puran Dhani Soamiji Maharaj, the first Sant Sat Guru who revealed the Radhasoami Faith, should similarly have a beautiful amalgam of the diverse and varied styles and forms of architecture from all races and nations". Thus, the idea of erecting a magnificent and stupendous Samadh building befitting the memory of the August Founder of Radhasoami Faith, first occurred to Maharaj Saheb, the third Sant Sat Guru of the Faith. Accordingly, the foundation was laid by Him in 1904. The date of foundation laying was Baisakh Shukl Panchmi, Wednesday, Samvat 1961 Vikram, corresponding to 20th April 1904. Babuji Maharaj appointed Lala Tota Ram as the Supervising Engineer, Samadh Works, Soami Bagh. Agra. Lala Tota Ram joined on 1st December 1907. The present hall of the Samadh was constructed in 1925 using the same foundation that was laid in 1904 for the Samadh of Soamiji Maharaj. While delivering a discourse on August 23, 1937 in the open Satsang held in the Samadh hall, Babuji Maharaj was graciously pleased to pronounce - "If replica of Sat Lok is there on the surface of earth anywhere, it is here, it is here, it is here. "Saying or thinking that the Samadh is also a temple is not proper. It is also not proper to think that one will obtain salvation through Samadhs. The ashes of the past Sants have been kept in Samadhs and doing this is an indication of the regard and reverence towards them. Samadhs are constructed at the places where the Sant Sat Gurus presided and held Satsang. By visiting and paying obeisance, a transformation takes place in the mind, such that it gets inclined towards Parmarth. Therefore, visiting the Samadhs, paying obeisance and performing Satsang there is in practice and is considered proper ". There is a spiritual significance to the measure of '68' in the 68 sq.ft main hall. There are said to be 68 places of pilgrimage. Hence by visiting Holy Samadh of Soamiji Maharaj, one will earn as much spiritual sanctity or derive as much spiritual benefit, as one does by visiting 68 pilgrimage sites, of course in the mood of sincere devotion. Read Less..
Bhajan Ghar is located in the premises of Soami Bagh, Agra. Soamiji Maharaj visited Soami Bagh daily and returned in the evening. He used to perform Bhajan, take His meal, hold Satsang and distribute Prashad here. There was no room or house at this place at that time. There were thatched sheds only. Under one of such sheds, Soamiji Maharaj used to perform Bhajan, which is now known as Bhajan Ghar (House of Devotion). It is a place of special importance for performing spiritual practices. The devotee experiences greater bliss and his Surat ascends with some ease during Bhajan in Bhajan Ghar. It has been said by Babuji Maharaj that those who perform devotional practices in Bhajan Ghar, will get added grace and mercy of the Supreme father, Radhasoami Dayal. They will experience greater facility and ease in the proper performance of devotional exercises. It is so because Soamiji Maharaj performed Abhyas in Bhajan Ghar. Kothi of Babuji Maharaj is located in the premises of Soami Bagh, Agra. Babuji Maharaj lived in a rented house in Atarsooiya, Allahabad. A little further away, lived Maharaj Saheb. For about 40 years, Satsang was held in this lane. The number of Satsangis was increasing day by day. On the occasions of holidays and festivals, there used to be such a great rush that many people could neither get Darshan nor hear discourses properly. For office work, the space was not adequate. For lodging out station Satsangis, buildings were rented. Thus, hundreds of rupees were spent on rent every month. Ultimately, Babuji Maharaj decided to shift the Satsang headquarters from Allahabad to Soami Bagh, Agra. There were many requests and supplications from the Satsangis of Allahabad against this. Babuji Maharaj said that Huzur Maharaj had ordered Him to pass the last days of His life in Soami Bagh, Agra. The Kothi (house) of Babuji Maharaj had been constructed in Soami Bagh in 1922 itself. Babuji Maharaj arrived permanently in His Kothi at 7:30 PM on November 29, 1937. Babuji Maharaj's Kothi was His place of residence. It was here that Babuji Maharaj held Satsang and it was here that He left His mortal coil and departed to His Nij Dham. After the departure of Babuji Maharaj, four Satsangs are regularly held every day in Soami Bagh, of which two Satsangs, (one in the morning and one in the evening), are held at Babuji Maharaj's Kothi. Radha Bagh is located in Agra city, 2.5 kms from Soami Bagh. In Soami Bagh, when the Samadh built of red sand stone constructed by Huzur Maharaj was demolished in 1904, its stones and other materials were used in the construction of the Samadh of Radhaji Maharaj in Radha Bagh, where some portion of Her ashes has also been enshrined. The rest of Her ashes are with those of Soamiji Maharaj in the Samadh of Soamiji Maharaj in Soami Bagh, Agra. In Soamiji Maharaj's time, there was only a raised earth mound in Radha Bagh. When in Radha Bagh, Soamiji Maharaj used to sit on it and at times, perform Bhajan too. After Soamiji Maharaj's departure to His Original Abode, a platform and a room were built on this mound. In this act of Sewa, along with other Satsangis, Maharaj Saheb and Babuji Maharaj also took part, that is, they also carried basketfuls of earth dug up for the construction. The palanquin used by Soamiji Maharaj is also kept here. Once, on a specific occasion, Bahuji Maharaj had observed that "Radha Bagh is not a picnic spot, rather it would be a place of worship". When Babuji Maharaj left His mortal coil, His last rites were conducted in Radha Bagh itself and subsequently His Samadh was also constructed in Radha Bagh. Since then, till today, evening Satsang on the 20 th of every month is held in the Samadh of Babuji Maharaj at Radha Bagh, instead of His Kothi in Soami Bagh. Panni Gali is a lane situated in Agra city, 6.5 kms from Soami Bagh. 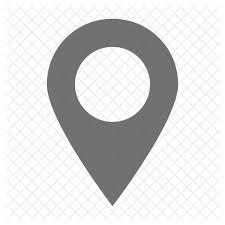 In this lane is a residence which is the place of birth and departure to eternal abode of Param Purush Puran Dhani Soamiji Maharaj and this is the place where He resided. Here, there is a small room within another room. This place has a special significance. Read More..
Where on Monday the 24th August 1818 Param Purush Puran Dhani Soamiji Maharaj was born. Where for a number of years Soamiji Maharaj performed Abhyas. Where on Sunday the 14th November 1858 took place the first historic meeting between Soamiji Maharaj and Huzur Maharaj. Where Soamiji Maharaj initiated Huzur Maharaj. Where on Friday the 15th February 1861, Soamiji Maharaj started General Satsang open to all. Where in January 1874, Soamiji Maharaj initiated Babuji Maharaj. Where on Saturday the 15th June 1878, Soamiji Maharaj left His mortal coil. It is said that during the period of Soamiji Maharaj, Panni Gali was in a very bad condition. At some places, there were pitfalls, at others there were slopes or inclines. The stinking water from the lavatories used to flow here, there and everywhere in the lane. There was always the danger of slipping and breaking one's limbs. The residential house of Soamiji Maharaj was also of kachcha bricks (made of unbaked bricks and mud) and small. In fact, Panni Gali, where Soamiji Maharaj assumed bodily form, established and held Satsang for years, was a place fit only for ardent lovers and true devotees like Huzur Maharaj who were totally oblivious of pitfalls and dirty drains in the lane. Babuji Maharaj was once pleased to declare that Panni Gali is really Prem Gali, that is, the lane of love. The old residential house of Soamiji Maharaj was demolished and reconstructed under the supervision of the late Sri Tota Ram, the Supervising Engineer of the Radhasoami Samadh Works. Babuji Maharaj had instructed Sri Tota Ram in the following words: "As Soamiji Maharaj was born and had resided and held His Satsang in this house for 60 years, every particle of it has been highly spiritualised. Every brick of this house is saturated with Shabd and Sound Current. Hence, not a single piece out of the broken fragments of this sacred house should be thrown away. Bricks, brick-bats, mortar and earth of this house should be used during the course of construction of this house along with new material ". The new house was completed in July 1916, much before the celebration of the first birth centenary of Soamiji Maharaj in 1918. Read Less..
Pipal Mandi is an area situated in Agra city, 6.5 kms from Soami Bagh. This was the residence of Huzur Maharaj. The place where His house with a big gate now exists, had a high mound and open land. Huzur Maharaj purchased this land and built a splendid mansion on it with seven courtyards. This house is known as Huzuri Bhawan. Its construction was complete when Huzur Maharaj came over from Allahabad after retirement. Two houses adjacent to each other were purchased in front of Huzuri Bhawan in March 1893 for accommodating outstation Satsangis. They are known as "Prem Niwas". There are four or five courtyards and about forty big and small rooms. Another house just adjacent to Huzuri Bhawan in the north, formerly Mufid-i-am-School, was purchased in June 1896. This is Prem Bilas. When alterations, additions and repairs had been carried out, Huzur Maharaj left his residential house and shifted to Prem Bilas. He would go to His residential house occasionally, but sometime before His departure, he permanently resided in Prem Bilas. Prem Bilas means bliss of love. A lot of spiritual pleasure and enjoyment of Sant's company, discourses, Artis (ceremonial functions of prayer) Bhog and Bhandara feasts took place here. As in Soami Bagh, Agra, Soamiji Maharaj had pointed towards a mound, on which His Samadh is presently being built, and had observed that a Gurudwara would stand there, so also when the hall (Satsang-hall) was under construction in Soami Bagh, Varanasi, Maharaj Saheb had observed that He would hold Satsang there. The hall in Soami Bagh, Varanasi, where Satsang is held now-a-days, was under construction in Maharaj Saheb's time and the same was converted into His Samadh after His departure. 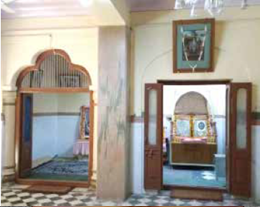 On the north of the hall there is a platform like a stage, in the centre of which lies the Samadh of Maharaj Saheb, with sufficient space provided on either side for ladies to sit during Satsang (congregation). The balconies on the three sides of the hall facing the Samadh are also meant for ladies to sit during congregation. The iron gate of Soami Bagh was fabricated in Calcutta (now Kolkata). When the gate was being fixed up, the Maharaja (ruler) of Varanasi happened to pass that way in his horse driven carriage. Amazed to see such a big gate, he remarked that it was unbelievable that a gate bigger than that of his own palace existed in his State! When he was told that it was the Guru-Darbar (Guru's court), he bowed his head in reverence. It is said that even today when the ruler of Kashi and his heirs pass that way, they bow their heads down in reverence before Soami Bagh. Any seeker desiring initiation, should write to "The Secretary, Central Administrative Council, Radhasoami Satsang, Soami Bagh, Agra-282005, India" or email at rssoamibagh@gmail.com to get the exact process and guidance. Seeker has to visit Soami Bagh, Agra and make a request to The Secretary, Central Administrative Council, Radhasoami Satsang, Soami Bagh, Agra, India of his/her intent. He/She believes Radhasoami to be the true name of the Supreme Being. He/She is willing to totally abstain from any animal food (including fish and eggs) and intoxicants of all types. He/She is willing to give up all past faiths and beliefs, based on a proper understanding of Radhasoami faith. Normally the seeker is required to visit Soami Bagh, Agra. In case he/she is not in a position to visit Soami Bagh, Agra for certain reasons, there is a provision for granting Initiation through letter in which case a senior Satsangi in the same region can meet and explain the modes of practice personally. This is granted only in exceptional circumstances and normally it is expected that a seeker will take his initiation at Soami Bagh, Agra only. While writing/e-mailing, kindly mention all details like ID card number, Name of the primary contact person, residence address, contact number, email ID, number of people visiting, duration of stay and any special assistance, if required. Weather in Agra and Varanasi varies substantially with the season. There are no items in playlist!